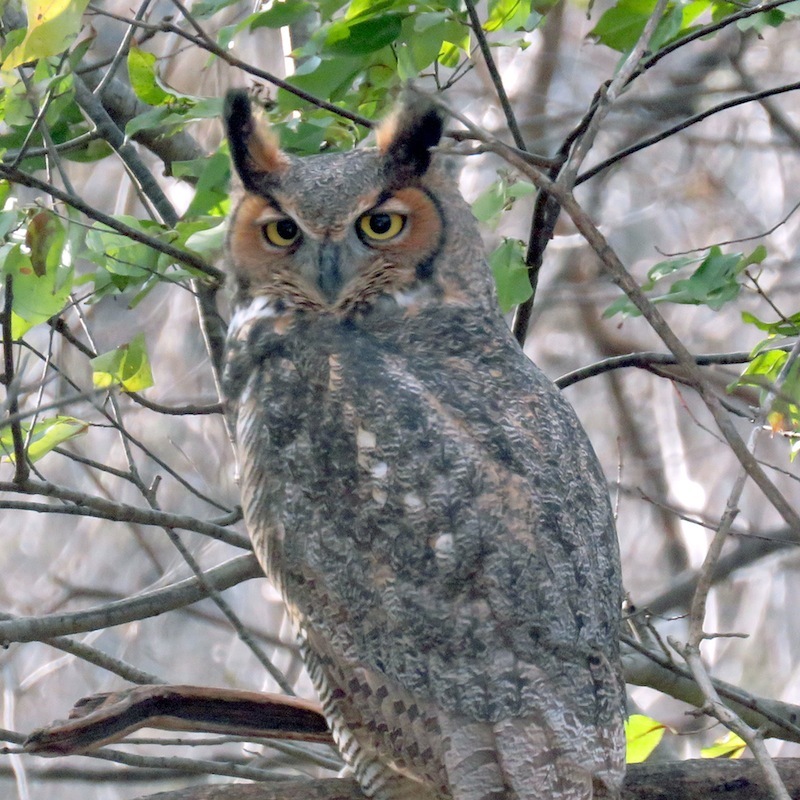 In February we told the story of a great horned owl visiting our backyard. Before that day, we never saw or heard one in our yard. Today we had the privilege of a second visit. This time it perched on a lower branch than before, and Jim was able to get some terrific shots. Great Horned Owl. Eastern Iowa. 11/15/2017. Photo by Jim Ruebush. Click on any picture below to embiggen. And here is a short video to show a bit of personality. We watched it as a cat roamed through our yard beneath it. The cat was lucky the owl wasn’t ready for dinner. Later a squirrel grazed under the bird feeder and similarly escaped a violent death. It was quite a treat to see this beautiful bird. This entry was posted in Backyard, Birds, Nature and tagged Great horned owl, Owl on November 15, 2017 by Melanie McNeil. You’re welcome. We always enjoy having owls visit. Usually it is barred owls, regulars in our neighborhood. Thanks for taking a look. Oh, those eyes! Loved the video – thanks for sharing these! Yes, it’s so amazing! I give Jim credit for his patience and steadiness waiting for the bird to turn our way. Wow! I’ve caught fleeting glimpses, but nothing like these pictures. We do have a screech owl in our neighborhood that lets off blood-curdling screams. I can’t tell you how many times we checked on our neighbors! I think that would be terrifying! 🙂 Thanks for taking a look. It was very beautiful. If we’re lucky, it will come back again. These are wonderful photos. I only recently learned that the owl isn’t the only bird that turns its head rather than its eyes: apparently most (all?) raptors have fixed eyes but incredibly flexible necks. The owl is the most flexible, though: able to turn its head 270 degrees. The pattern in its feathers is so intricate. It occurred to me that it’s perfectly outfitted for hiding away in a tree. In dappled shade, it could be nearly impossible to see. I loved looking at its feathers. And the colors, especially on its face! It was fun. We hope it will come back. On another topic entirely, I was going to tell you and Jim about something that showed up in my mailbox: a gift catalogue from the Amana Meat Shop and Smokehouse. By the time I got to the page with the breaded pork tenderloins, I was ready to get out the credit card. I resisted, but my goodness — you just can’t get a decent breaded tenderloin down here. How I got on their list is a mystery, but it was fun leafing through the catalogue. Actually, I could buy enough gas to get me to Kansas City and back with what they’re charging. I’ll just go to KC and get my aunt to go out with me for a pork tenderloin! I was excited to see these wonderful photos and the video of the owl. Wow! We’ve been hearing them in the neighborhood lately. I understand that skunks are their favorite food, and we do have an abundance of skunks….or at least, we did! What a treat it is to have such a beautiful creature take residence in your yard. I just love it when nature not only stops in to say hello but graciously allows us to capture their spirit. Seeing how windy it was, you got some excellent shots…love the video! Oh my goodness, Jim got some lovely pictures! We’ll look forward to its next visit, but of course they can be so quiet, they might be here all the time and we never know. Thanks for taking a look. Isn’t it amazing? It was such a treat to see. Thanks for reading and commenting today.